I’ve made it no secret in the past that I absolutely love Suburbia despite it having all the visual appeal of a charted accountant’s wastepaper bin. The grim, austere graphical design and the furious calculation that goes into every move make it a difficult sell to non-gamers though. The game is funny and vibrant and coruscating with energy but you’d never know it to look at it. That’s a shame because city building is a natural fit for games, in large part because Sim City and other titles have pretty much proven again and again there’s fun to be had in civic engineering. 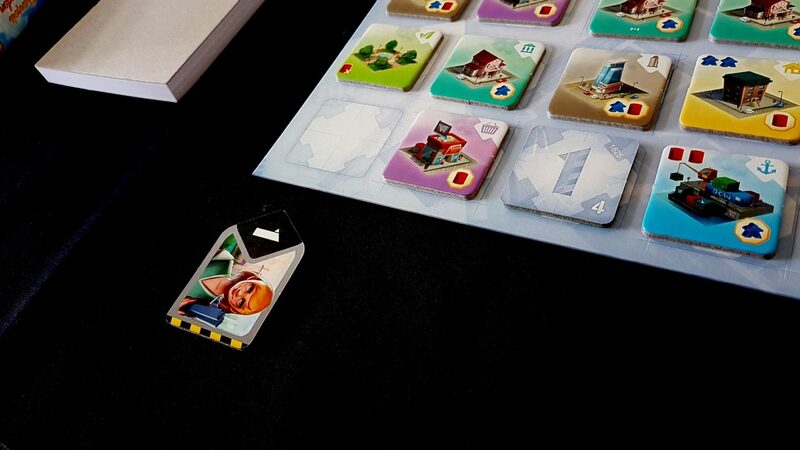 It’s still tricky to convince people to give Suburbia a go. The dead-eyed couple on the box of Suburbia look like they’re going to arrange their double funeral once they’ve signed the missives on their new home. 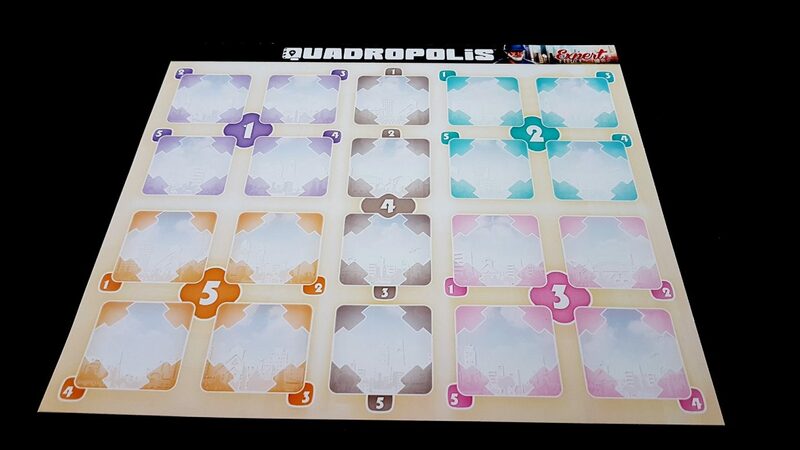 Quadropolis though looks like it was designed by Maxis. Its cheerful and charming aesthetic says ‘come on, this is going to be fun. You’re going to enjoy this’. A lot of the music to this on Melodice is from the Sims. It’s very fitting. I was very hesitant about picking this up despite everything about it trying to make me do so. I’ve mentioned elsewhere on this blog that thematic overlap is something that I try to avoid too much of in my collection. 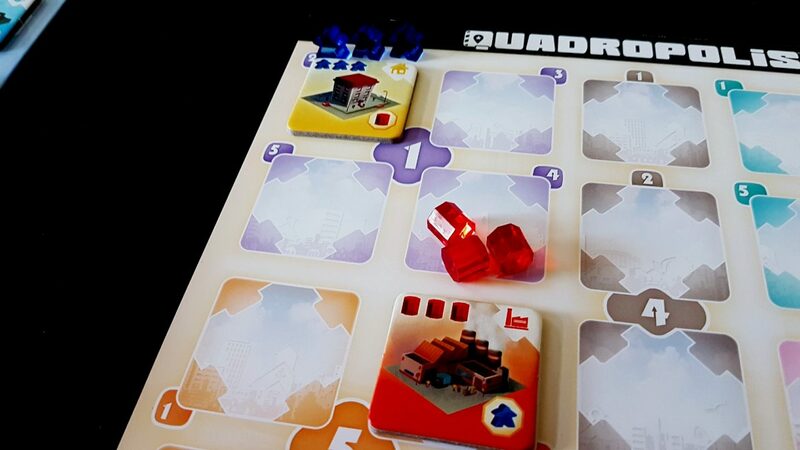 In my Lanterns review I specifically mentioned Quadropolis as an example of a game that was low down on my purchase list as a result. 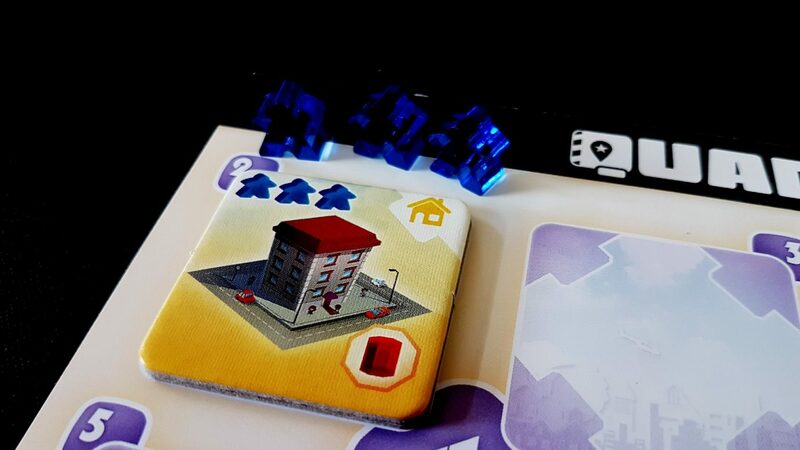 The good news is that this co-exists very happily with Suburbia – they play very differently, and as such while they’re both ostensibly games about city building they’re very different kinds of cities and very different kinds of building. 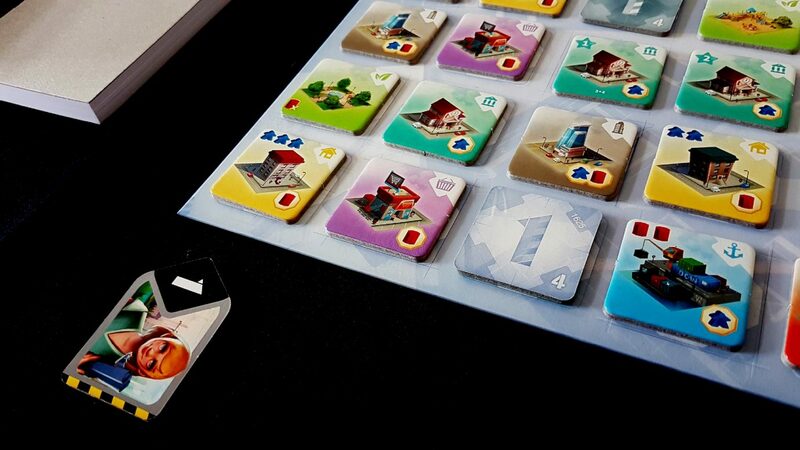 Quadropolis stands proud on its own merits and makes a sensible addition to any game shelf whether or not that shelf also contains Suburbia. In this review, I am going to be talking about the ‘expert’ version of the rules – there’s a ‘classic’ version too but we ignored that one because that suggestion was the prevailing wisdom on the Internet and I am nothing if not slavishly subservient to the wisdom of the crowds. We’ll talk about the classic version in the teardown. 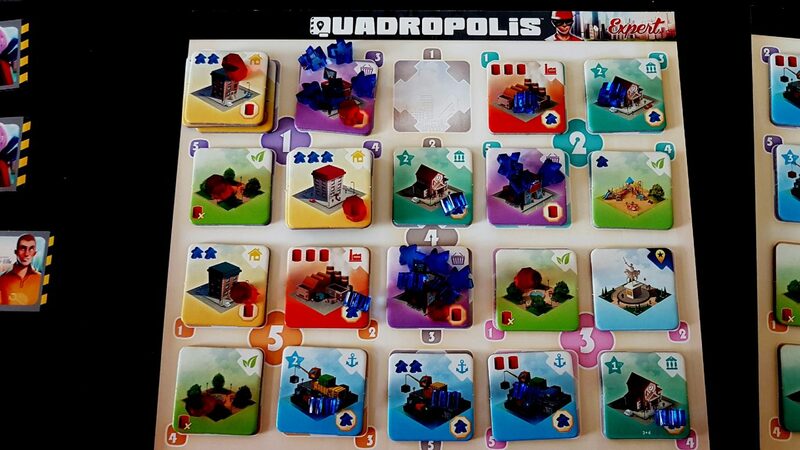 If in reading this review you think ‘That sounds fun but I’d really like something that’s easier and much less interesting’, Quadropolis has you covered there. 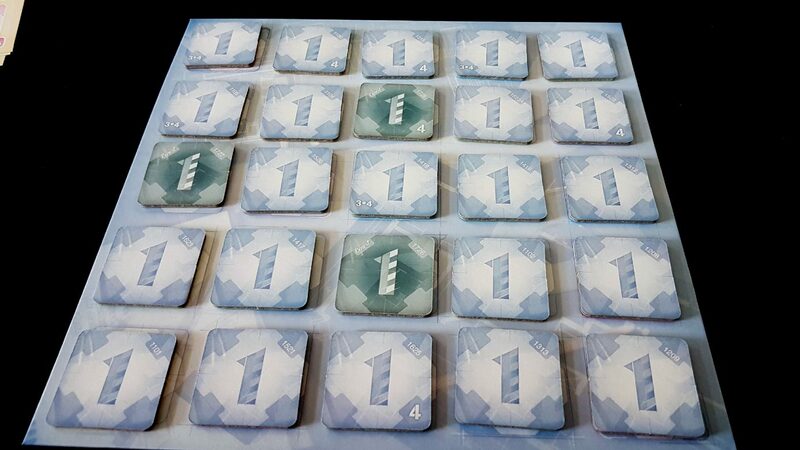 The game comes with tiles and boards you can swap around to give you the play experience you want. Trust me though, barring accessibility considerations you’ll want the expert game. Each player starts with a cardboard player mat that indicates the newly broken ground of their city. It’s separated into districts (marked by a number), and each of the locations within those districts are marked with numbers of their own. Think of these as ‘lot numbers’. Your player mat is the virgin dirt below the steel and glass monstrosity you are going to construct in open defiance of God. It looks so untouched and pristine to begin with – full of promise and pregnant with opportunity. That’s going to change. Oh my God, that’s going to change. In the centre of the table sits the construction yard where all the buildings available for placement will be shared amongst the various cities. The city of Meepopolis might want an office block but whether it can get it depends on the whims of the table and the shifting marketplace of availability. 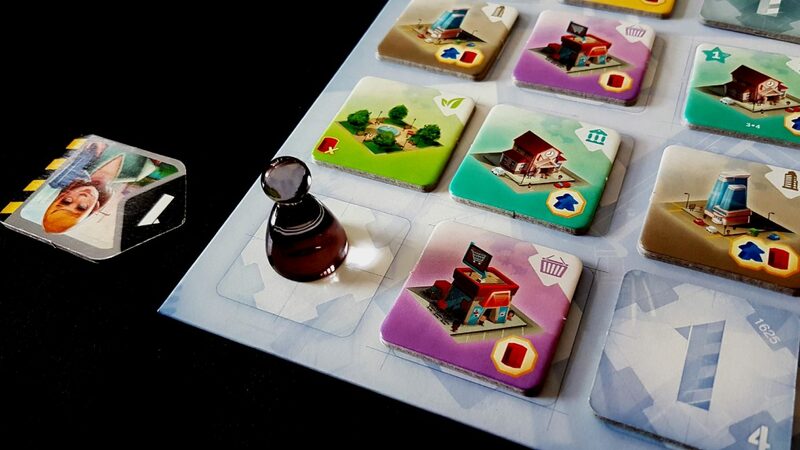 The game is played over five rounds – in each round, a stack of tiles will be randomly dealt out to the yard, and then players will take it in turn order to select one and build it. The exact composition of the yard changes game to game, and this has a powerful effect on how well your city will function. The game begins. You get the round one tiles, choose whether it’s the expert or classic game you want (it’s the expert game, honest) and then you shuffle those up and draw them from a bag and lay them down in order on the grid. Or you ignore the bag entirely because it turns a minor trial into a major chore. We just shuffle them up and distribute them wildly. Whatever way you do this, you end up with the world’s least interesting spreadsheet arrayed in front of you. Along the top of each of these tiles are icons that represent what they produce. Some buildings produce nothing in and of themselves. Some produce red energy barrels. 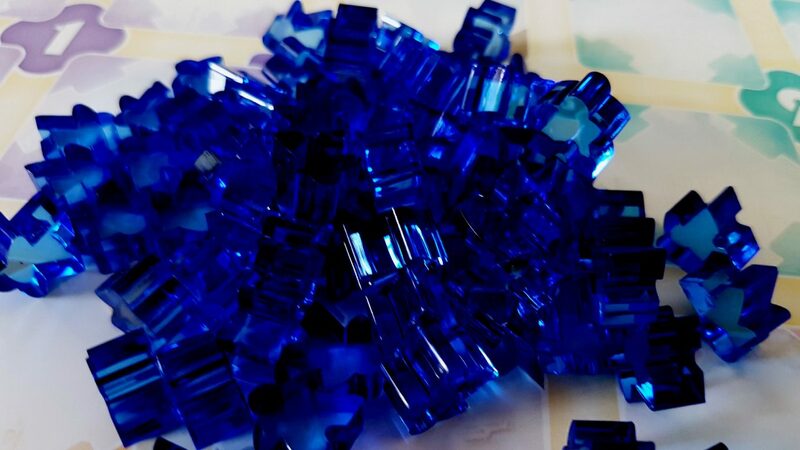 Others produce transparent blue meeples. You get these resources as soon as you place the tile in the city, and you’ll use these to activate other buildings. At the bottom right of each tile is the activation cost. Buildings must be activated in order to score at the end of the game, so part of your job is to ensure power and people keep flooding into the city. You’re the opposite of Brexiteer, in other words. However, unused resources at the end of the game count as and inflict a scoring penalty. Those red barrels become pollution, and those unused people become the human by-products of a Capitalist system that neither wants their labour nor cares about their wellbeing. You want a city that uses everything it produces. Some buildings offer victory points, some offer opportunities to safely dump pollution at the game end through carbon offsetting. Regardless of the inputs and outputs of the buildings though, they have one real value to the player – each of them is a scoring opportunity, and each is scored entirely differently. Some are scored as individual units, others scored in relation to the buildings in their four cell neighbourhood. Others are scored for both. Office buildings reward a player that builds them high and sprawls them widely. Harbours benefit the player that builds them in contiguous straight lines. Parks accumulate points when they’re surrounded by tower blocks, and shops earn points for being stuffed full of people. There are adjacency effects too – power plants next to shops, harbours and offices score well, but they apply a hefty penalty if they’re next to monuments. Public sector buildings need to be spread around the districts for optimal scoring. It’s all somewhat byzantine on your first play-through of the game but it gradually becomes second nature because it roughly mirrors the interconnectivity of real life cities. Simpler, sure – but common sense interactions reign for the most part. People in Quadropolis aren’t great liars. I can see right through them. Easy, right? A doddle, yes? You just decide what kind of city you want, you claim the buildings, and you reap the rewards. What could be simpler? What could be nicer? What could be better than spending a nice evening building imaginary cities with your friends? I’ll tell you what could be better! It’s Quadropolis’ architect system! Here’s the thing – you don’t pick buildings from the market. That’s not how this works, and you were a fool to think so. A mad, impulsive, beautiful fool. No, you pick an architect and the architect lets you pick from a subset of the buildings. You point the architect at a row or column, and you count the architect’s number along the direction it’s facing. The tile you pinpoint in this way is the tile you place in your city. You can pick any row or column, provided there isn’t already an architect there. In the example above, you pick the tile that’s one away from the architect. If you picked the two architect, you’d get a park. A three would get you the office block, and so on. In this case, one gets you the tower building that will gain you three people for your early stage metropolis. That’s better than just selecting a tile, isn’t it? Of course it is. Since there are a limited number of architects of each number, everyone is competing over the architects that lead to the choicest opportunities. 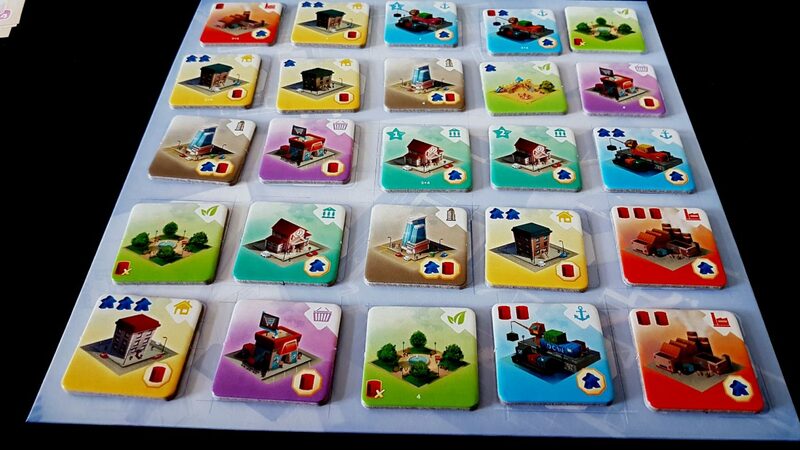 The nature of the board though means that you have lots of numbers that can get you the tile you want. That one from the bottom of the board could just as easily be a five from the top. A two from the side might be a four from the bottom, and so on. It’s a very open form of artificial constraint that can, on occasion, make you feel quite clever for seeing a solution to your immediate problem, or a way to prevent an opponent from capitalising on a gap in the market. There’s more though to the architect system than this, because of course there is. When you pick a tile, you place the glistening urbanist pawn in its place. There’s another rule for placing architects – they can’t be placed on top of an existing architect, but they also can’t be placed pointing at the urbanist. The urbanist, who I like to think is a civil engineer driven to insatiable bloodlust by the pressures of the job, distorts the marketplace in all kinds of interesting ways. 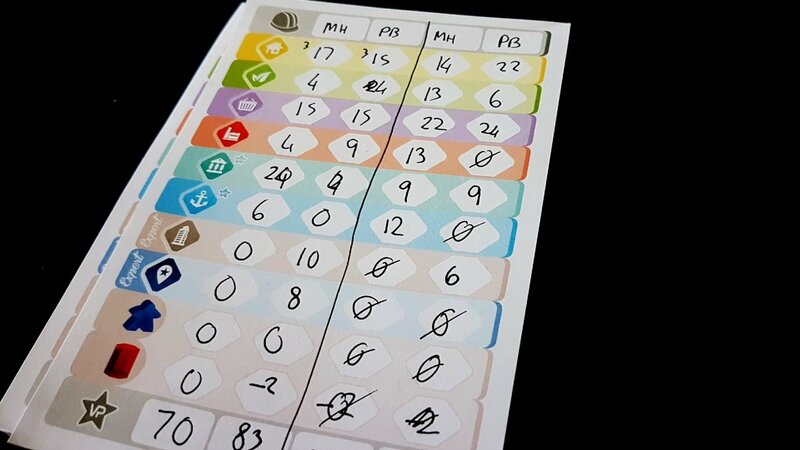 The urbanist locks off a row and a column, and that’s a major problem in a game with only five of each. This gives you another obstacle to feel clever about overcoming, or spitefully joyful about throwing in front of someone else. That’s better than just picking an architect, isn’t it? Of course it is. There’s more still though, because of course there is! The architect doesn’t just determine which building you get. Oh no. The architect also determines where it can go. The architect number determines the valid district, the valid lot, or the valid floor of a building if you’re building upwards. It’s this more than anything else that drives Quadropolis forward. The architect system permits multiple paths to a single tile whilst also making sure that it’s a real, ongoing challenge to put it where you want it to go. Sure, that five architect might get you the tile you want but where is it going to send it? Will it do you any good there? Will it do active harm? Harbour tiles for example need precise placement, and ideally should flow by a power plant. You can probably make that happen under ideal circumstances, but your fellow city planners are all about making sure your circumstances aren’t ideal. This all comes together to give a city a very real, organic feeling of growth and districtification. 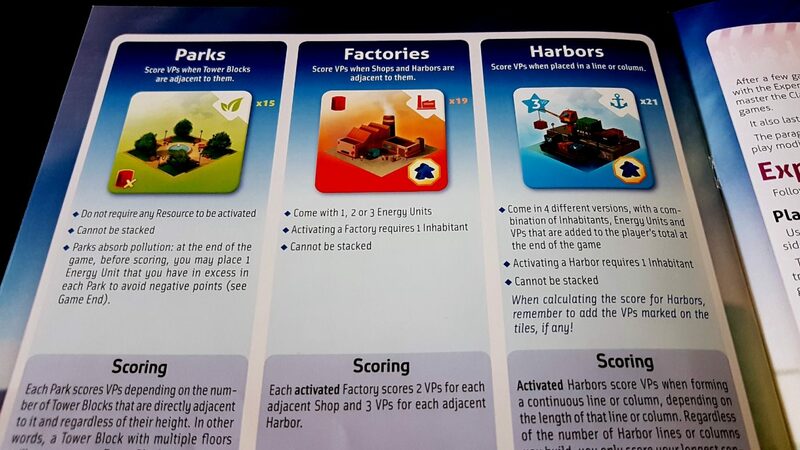 You’ll find the industrial quarter emerges quite naturally because of the implications of adjacency in scoring. You’ll find urban sprawl since architects being able to define floor as well as district incentivises you to use them to that effect. You’ll find residential gardens and playparks tend to grow a distance from the harbour, and in-fill between regions becomes clogged with bureaucracy and civic aggrandisement. It all starts from a seed you plant with your very first choice – no matter the way you want to play the game, it’s got a different plan for you. Eventually there are so many architects around the yard and so few buildings that you’re taking whatever is available and making do. Your plans have to be flexible as a result. You’ll find yourself making real, genuine concessions in your artistic vision just because the logistics don’t work out. You’ll abandon your riverside project half done just to make sure you’re not going to be outshone on public infrastructure by someone else. You’ll concrete over a lot you’d picked out for a park just because you suddenly got an opportunity for an especially powerful factory. You’ll fill tower blocks full of people just to leech every penny out of them at the adjacent mega-mall. You’ll become the kind of monster you always bemoaned when you watched your neighbourhood demolished by the hungry whims of globalised identikit retail outlets. You simultaneously become the faceless instrument of gentrification and the relentless wraith of compromise sucking the life out of the high street. The kids didn’t need that park anyway. That hospital would be better as a new shop. Who really uses harbours any more anyway? 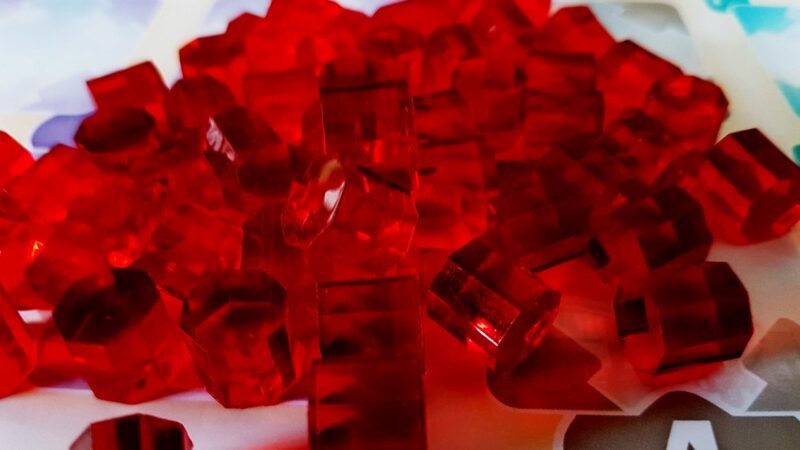 The Meeple Bank needs new offices and they’ll reward you handsomely for making them happen. Those difficult decisions though – they’re quite far away. In the first round you’ve got more room to build than you know what to do with. You’re luring people in with promises of how wonderful a place Craiglang will be to bring up a family. You’re getting the energy company to set up shop with promises of influence and access. You’re building up the resources you’ll need to support the aspirations of the city and you’re feeling good while doing it. Turns in Quadropolis are very quick because while you make difficult decisions they’re always directed by the compromised choices that came before. You’re not looking at the board wondering what you should do. You’re looking at your city wondering how to do what you want to do. As such, while everyone else is grabbing buildings and furtively placing them somewhere safe you’re just eyeing up the tiles you need and working out how badly things can go wrong before you get to them. By the time your turn has come around you’ve usually pretty much decided what you’re going for. As such it’s a pleasantly brisk experience of play. The downside there is that by the time the final round raises its head you’re looking in despair at all the resources you’ve accumulated. 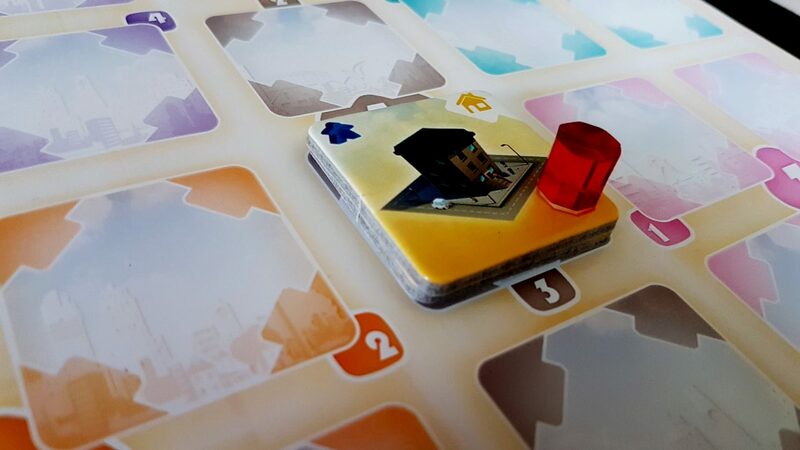 You’re looking forlornly at the supply of buildings and wondering exactly how you’re going to spend them before the city is complete and the budget finally balanced. To begin with you can be profligate in your resource production knowing you’ve got all the time in the world to spend what you generate. There’s a pivot point though where the implications of your decisions mean that you’re soon wondering how to produce the least waste in order to use the largest number of resources. Sometimes you’ll build things with no value just because they let you spend your budget – even political boondoggles are modeled in Quadropolis. This is a satisfying game – it just feels nice to look down upon a city and see the value of each building increase as you lay down your plans for future construction. ‘I’ll build a park there, and then a monument next to it’, or ‘I’ll sprawl those offices off towards the docks and the power plant’. Every new spurt of energy and people makes the puzzle of the game more intense – it adds new moving parts that need to be considered. You need resources to activate buildings, but they’re only ever scored at the end. You might be constantly revaluating whether you need someone to staff that dock area when you’d get more points for shoving them in an empty shop. Whether you need to power that shop when nobody is in it, or whether you just want to keep the lights on to cook the books. At the final point, everyone locks in their city configuration and then the audit begins. 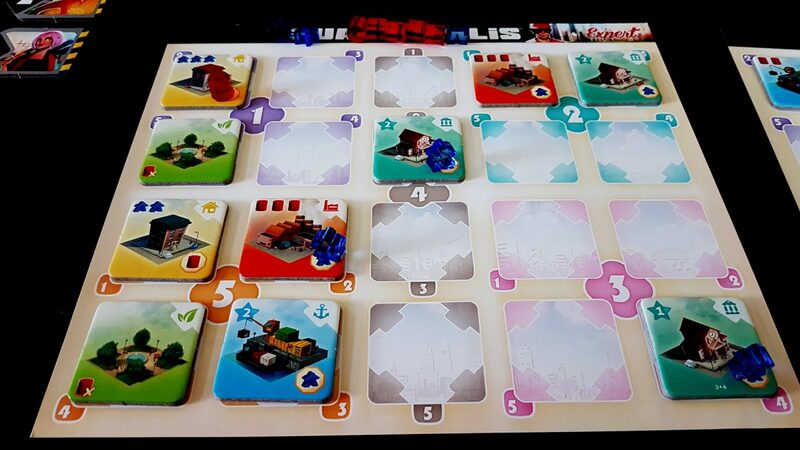 In the end though Quadropolis doesn’t shine as a game of city building – the systems are too shallow, the options are too limited. 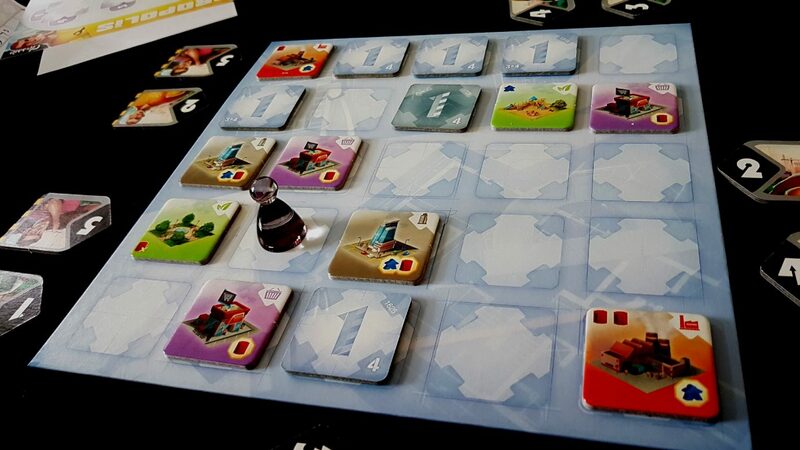 Quadropolis though does shine as a vaguely thematic puzzle game where the tightly interlocked systems combine to apply an ever more restrictive pressure on the tempo of play. Like being enveloped by an anaconda, if you don’t keep calm you’ll find every previous decision ends up crushing the life out of you. The fun comes from pacing your breathing and trying to survive, it doesn’t come from the joy of construction. You will see your city emerge in an organic way, but you won’t ever see any actual life in there. It’s difficult to visualise how the city you made works because it’s all rather sterile in the end. It’s not a game of giving birth to a bustling city full of implied stories or experience. It’s a game of maximising the efficiency of placement and balancing outputs versus inputs. As such, while it’s certainly a game about building a city I don’t think it particularly succeeds in making you care about the end product other than as its fitness as expressed through a dispassionate scoring algorithm. City building games should make you feel an attachment to the city you created. All Quadropolis does is give you the fiscal return on the investment of time. 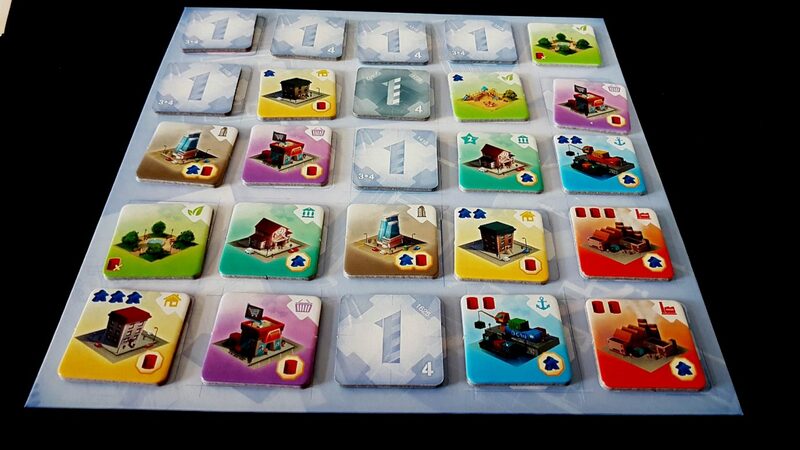 Quadropolis also involves a lot of setup and teardown – you’ll shuffle and deal out stacks of tiles five times during the game, and if it wasn’t for the fact the insert is a genuine aid to organisation this by itself would knock it down a star. I mention it here not because it’s a problem but because Days of Wonder have spent a lot of time considering what might be considered the ‘user interface’ to the game. It’s the first time where I think the standard box insert is part of that. 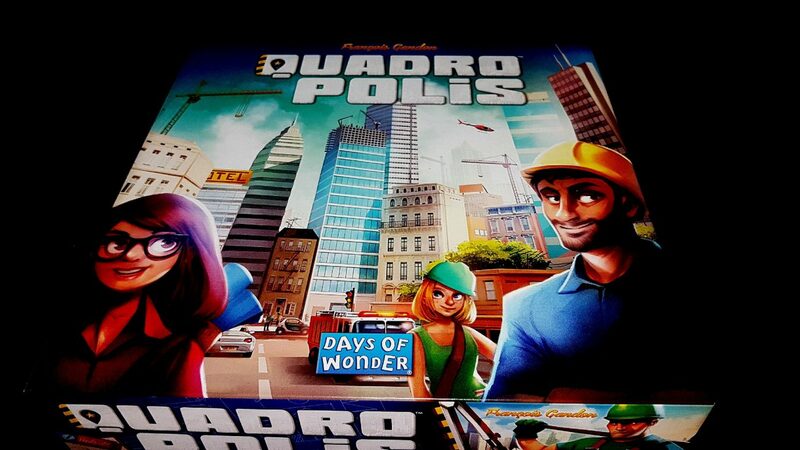 Days of Wonder are of course known for their often stellar production values, and while that’s certainly evident in parts of Quadropolis it’s surprisingly lacking in others. Your beautiful transparent resources and thick, chunky tiles are placed on a board of wafer thin cardboard. The construction yard that I got in the box was distorted so significantly I had to actually crack it a little to even get it to sit flat. That is perhaps an issue unique to my copy, but if the quality of the material used for it was higher that wouldn’t have been an issue for any copy. It’s weird to see one box that oscillates so dramatically from the genuinely lavish to the conspicuously cost-cutting. 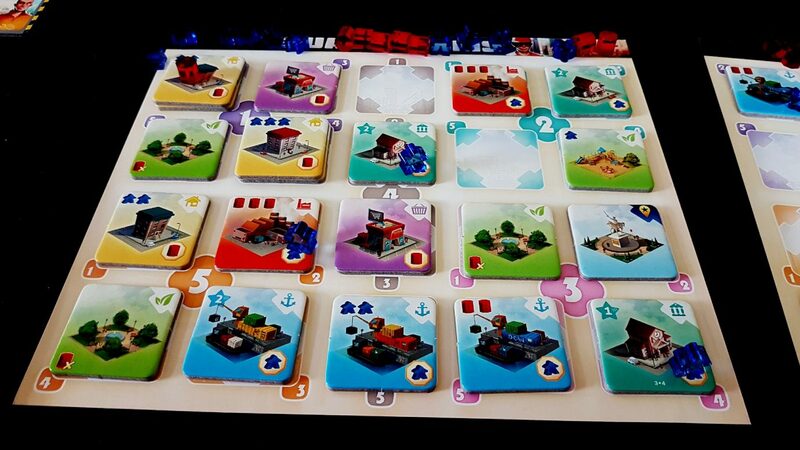 Enough of that though – Quadropolis is a great game that has just the right amount of brain-burning contemplation and quick, rapid decision making to create genuinely satisfying gameplay. It’s not going to dislodge Suburbia from its pre-eminent place in my collection, but it’s certainly going to sit happily alongside it for the foreseeable future. The algorithmic nature of the theme is a weakness for me, but it’s also the reason that the two games can happily co-exist. 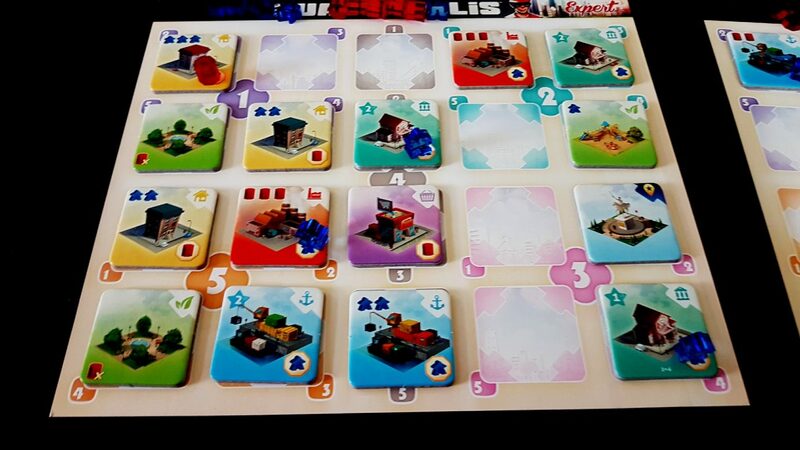 Quadropolis is very much worth picking up should you be in the market for a city building game you might actually convince non-gamers to play.